Did you know that 87% of the population has a foot-related problem and their feet may not even hurt? Do your feet hurt? Let’s face it, our feet are pretty important. It’s hard to ignore foot pain, but if you do, it can lead to many other problems. Changing the way you walk to try to lessen pain in the feet can create pain in your knees, hips, and more. The word orthotics comes from the Greek language and means “to straighten” or “align.” Poor alignment of the feet causes aches and pains in other parts of your body. When foot posture is not correct, the entire body can suffer, leading to painful conditions including knee, hip, back, neck and shoulder pain. Shoe orthotics can help tremendously by naturally realigning the feet. A common cause of foot pain is a condition called plantar fasciitis. The plantar fascia – a thick band of tissue on the bottom of your foot which runs between your heel bone and your toes – acts like a shock absorber. It can become inflamed and cause stabbing agony localized in the heel area or generalized throughout the arch of the foot, with every step you take. Standing and walking can become unbearable. “I’m amazed at how these shoe orthotics immediately helped my plantar fasciitis! Another cause of foot pain is poor arch support. If your feet aren’t supported properly, it can cause undue strain and pain. Shoe orthotics can help. Custom made shoe orthotics are inserts that fit into the footbed of your shoes. They are specially measured by Dr. Marcy to fit and support you. Who can benefit from shoe orthotics? In diabetic people, shoe orthotics may also be worn along with orthopedic footwear in the prevention of foot ulcers, since the diabetic foot is at risk from poor circulation. Overweight people can benefit from shoe orthotics because excess pounds put extra stress on your feet and knees. Runners can enjoy the benefits of shoe orthotics because of the extra stress running puts on the feet. People who wear shoes without adequate support in them are at risk of developing foot pain. In time, the shape of the foot will change if you wear improper footwear. 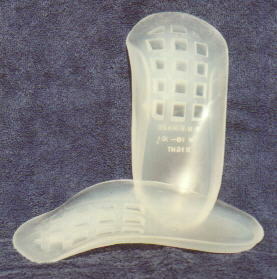 Orthotics allow the feet to regain correct posture. Custom shoe orthotics can turn inexpensive shoes into more supportive footwear. People with poor posture – both adults and children, can benefit greatly from shoe orthotics. People who stand for prolonged periods at their job. Call now to see if custom shoe orthotics can help YOU!